In October 2014, Beijing No. 80 High School welcomed a number of UK universities to our school. On October 20 and 21, The University of Birmingham University, The University of Kent and Nottingham University representatives visited the school and conducted class room discussions with Grade 12. Students in Grade 10-11 were invited to lunchtime presentations by these same universities. 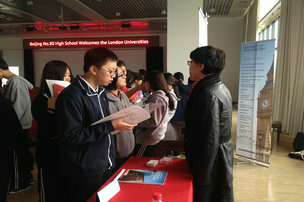 In addition, the Counseling department and Grade 10 B1 worked together to put on a London University Fair on October 22. At the London University Fair, there were many institutions, including the University of East London, Royal Veterinary College University of London, Queen Mary University of London, St George`s University of London, London Southbank University, Institute of Education University of London, Goldsmiths University of London, University of Westminster and the University of Roehampton. Universities set up information tables, and their representatives answered student and teacher questions and gave personal advice on students’ future educational plans. 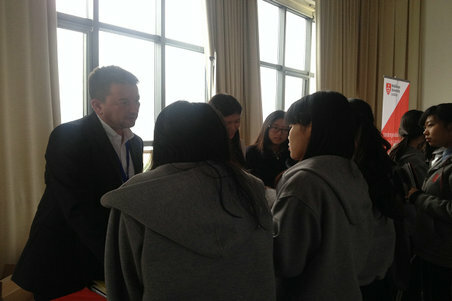 The London University Fair representatives were impressed by the good organization, publicity and warm welcome by the Beijing No 80 High School Grade 10 students, and we hope this will now become an annual event at our school. It is important to meet with university representatives. Although there is a lot of information on the internet, meeting university staff from the UK and sharing questions enables students from Sino-International Program students to have a better plan for their future and help in make the best decisions for their future.